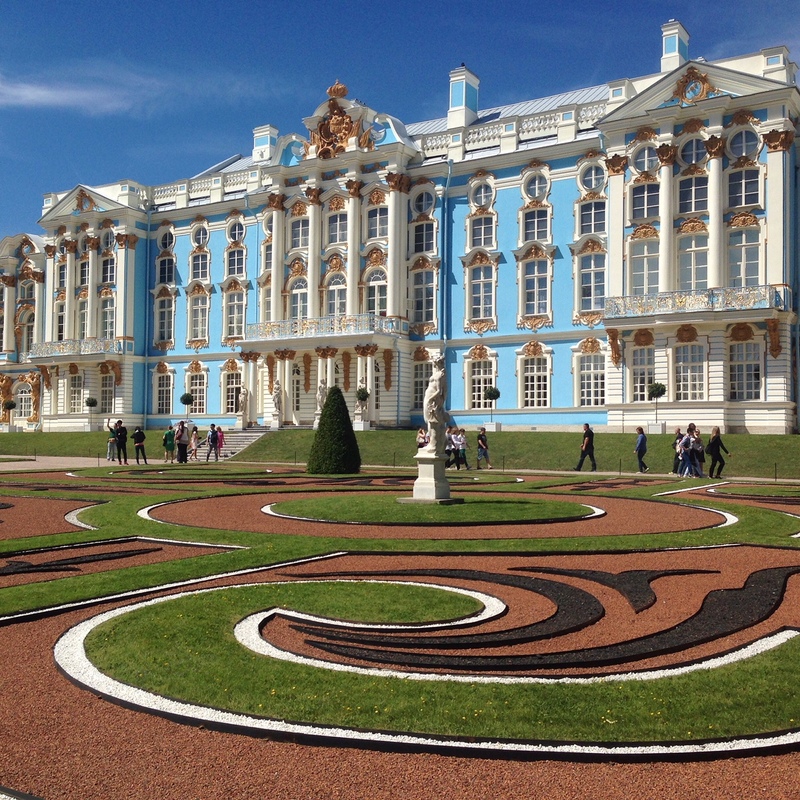 Catherine’s Palace was called this way after Catherine I, who was the wife of Peter the Great. She ruled the country, to be honest, not very successfully for two years after his death. The area of Tsar Village where the palace is located now, originally was a present from Peter I to his wife. He presented her with this piece of land for hunting. Later their daughter Empress Elizabeth chose this area to become her main summer residence. She ordered the architect Bartolomeo Rastrell, who worked in Renaissance Style, to reconstruct the palace fully. As a result she got the palace with white and blue facades richly decorated with gilded atlases, caryatids and other whimsical ornamentations made by German sculptor Franz Dunker. Both creators had to use almost 100 kilos of gold to gild everything from the outside. The interiors of the palace are also spectacular including Gold Enfilade and Gold Hall (Great Hall, Hall of Light). Thousands of guests enter the palace via Main Staircase that is made in Rococo Style because it appeared in the palace later in 1860s. Gold Hall is almost 1000 square meters and occupies the full width of the palace. This way through the large arched windows visitors have an opportunity to see superb views of the park. At the same time such windows provide enough light into the hall to emphasize so much gilded stucco decorating the walls. Gold Enfilade includes great interiors that always impress the guests – White Dining Room, Portrait Hall, Picture Gallery, famous Amber Room. In Portrait Hall visitors can enjoy very nice portraits of Catherine I and her daughter. Almost every inch of Picture Gallery walls is covered with painted canvases of the 17-18th centuries. Of course, Amber Room is the most famous interior of Catherine’s Palace and the hall that attracts the attention of every guest. Its walls are covered with amber panels originally created for Amber Cabinet at Konigsberg Castle. They were a present from Friedrich-Wilhelm I of Prussia to Peter the Great. Amber panels are richly decorated with gilded carving, mirrors and other ornamentations. The hall was finished in 1770 though big reconstructions took place in the hall 3 times within the 19th century. Most of the time Amber Hall was used for keeping the collection of amber works and Chinese porcelain. In 1941 Nazis stole the amber panels and they disappeared forever. Amber Room the palace guests see now is a replica. It took more than 20 years and 6 tons of raw amber to make it. The process began in 1982 and was successfully finished in 2003 for the 300th birthday anniversary of Saint-Petersburg. Catherine’s Palace with Amber Room is one of the main tourists’ attractions in Saint-Petersburg and its surroundings. The queues to this palace during the high season can be endless. It is advisable to book a guided tour to visit Catherine’s Palace. We are happy to offer our services to arrange it.